The year is almost at an end, but before we draw 2018 to a close, the DVC would like to officially announce try-out dates for playing squads and teams for the upcoming 2019 VV State League season (Mar-Aug 2019). We welcome all players (old and new) to join the DVC family as we continue to develop grassroots volleyball in through our volleyball program and through Victoria’s Premier Volleyball competition. Note: Playing squads will be finalised and announced on the 27th of January 2019. 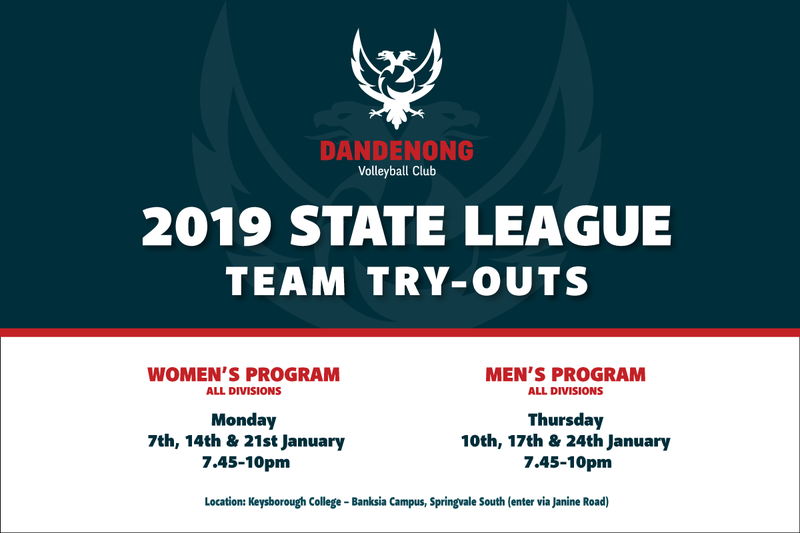 For more information please contact us directly via our website dandenongvolleyball.com or Facebook page. Finally, DVC would like to wish all our members and players a happy and safe festive season, spent with family and friends.